Searching for a spooky dish to serve up at your Halloween party? 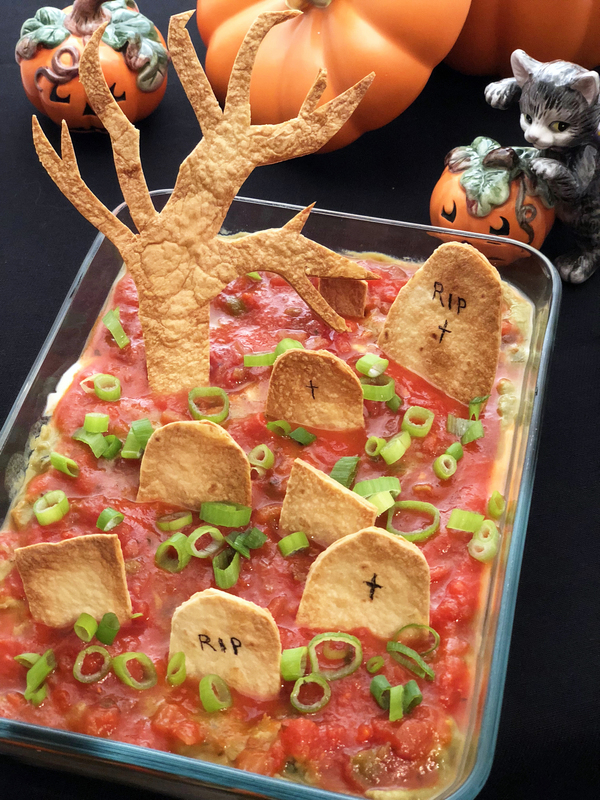 Complete with gravestone-shaped tortilla chips, this tasty taco dip sets the stage for things that go bump in the night while providing a tempting snack. 1. In a skillet over medium-high heat, cook your sausage meat with a tablespoon of butter or olive oil until browned and cooked through, stirring and breaking up into crumbles. When fully cooked, drain excess fat and set aside. 2. Mix your sour cream and taco seasoning in a small bowl. In another small bowl, mix your avocados, mayo and minced garlic. When cooked sausage meat has cooled down, mix it with your refried beans in a large bowl. 3. In a pie plate or glass dish, layer your taco dip with the beans and sausage mixture on the bottom, followed by the sour cream mixture, the avocado mixture and a layer of salsa. Sprinkle your chopped scallions over the top and chill for about an hour in the refrigerator. 4. Preheat the oven to 350°F. To make your shaped tortilla chips, lay out two large flour tortillas and use a small knife to cut out the shapes of a spooky tree and a handful of gravestones. Line a cookie sheet with parchment paper and lay out your spooky tortilla chip cut-outs, then bake at 350°F until the tortilla shapes are browned nicely but do not break. 5. Remove your taco dip from the fridge, decorate with the tortilla chip cut-outs to look like a graveyard and serve. Spooky! Love the taste of Premio Hot Italian Sausage meat in this spooky taco dip? Try all our flavorful sausage varieties by searching for Premio products in a store near you.